Tim Sherratt and Anne-Marie Condé, ‘A war against disease’, Australasian Science, vol. 14, no. 3, Spring 1994, p. 64. 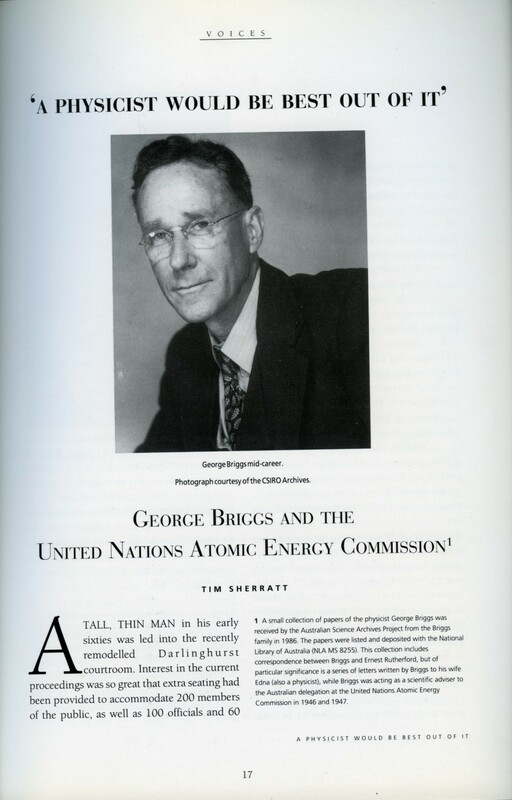 Tim Sherratt, ‘“A physicist would be best out of it”: George Briggs at the United Nations Atomic Energy Commission’, Voices, Autumn 1993. A tall, thin man in his early sixties was led into the recently remodelled Darlinghurst courtroom. Interest in the current proceedings was so great that extra seating had been provided to accommodate 200 members of the public, as well as 100 officials and 60 journalists. However, this session was to be heard in private, so the witness entered and was sworn before a strangely quiet and empty court. ‘What is your full name Doctor?’ asked W.J.V. Windeyer, the senior counsel, noted especially for his thorough but tedious manner. ‘George Henry Briggs‘ replied the witness. Tim Sherratt, ‘A model scientist: Edwin Hills’, Australasian Science, vol. 2, no. 1, Autumn 1993, p. 56. A relief map is a three-dimensional model that shows the features of a particular region, like mountains and valleys, to scale. You’ve probably all seen one at some stage, perhaps you’ve even built one. However, I don’t suppose you’ve ever thought that a relief map might provide a starting point for scientific research. But thanks to one influential Australian geologist, that’s just what happened. Tim Sherratt, ‘A passion for physics: Joan Freeman’, Australasian Science, vol. 2, no. 2, Winter 1993, p. 64. Funnily, much of what we call ‘big science’ is concerned with observing very small entities. Large, expensive machines are built to harness the unimaginable forces necessary to open the sub-atomic world to scrutiny.